Removing gum from clothes doesn't have to be a stressful situation. With a little patience and a few common household items, you can erase the sticky substance from all kinds of fabrics. Placing gum stained clothing in the freezer is by far the most popular way to get out of a sticky situation. This tried and true cleaning method has been around for decades and is extremely effective if done properly. By and large, gum is much easier to remove from fabric when it is hard. By freezing the offending clothing you can peel the gum off in large chunks rather than picking and scraping at it bit by bit. As soon as you realize gum has adhered to your jacket, jeans or shirt, place the article of clothing into a plastic zip lock bag and let it sit in the freezer for a few hours. Once time has elapsed, remove the item from the freezer and gently chip off the gum. It should peel off in one piece, and then you can wash the garment as usual. If you don't have the means to place the entire article of clothing in a freezer, then apply a cube of ice directly to the wad of gum. This method works well with smaller pieces of gum. For larger wads, place several ice cubes in a zip lock plastic bag along with the gum stained garment. Allow the ice to freeze the gum, and then you should be able to safely scrape off the sticky substance. Another popular method for removing gum from clothes is to smear the offending area with peanut butter. Start by dabbing just a small amount of creamy peanut butter on the gum, and then let it sit for several minutes. Next, use a soft cloth to wipe at the wad of gum. The oil from the peanut butter should help dissolve the sticky substance to the point where you can peel it off in large chunks. When it comes to removing gum from clothes, most people are not above experimentation. Over the years some have found success in treating gum stains with a variety of items found in their own pantries. For example, many people swear that Pam Cooking Spray is a gum eraser. Simply apply the non-stick cooking spray to the wad of gum and wipe with a clean cloth. When sprayed liberally on the garment, the oil from the product helps dissolve the gum. Another pantry item that works wonders on gum stained garments is white vinegar. Simply heat a small bowl of white vinegar in the microwave and pour it over the gummed-up article of clothing. Then, use a toothbrush to gently brush off the gum. If the gum wad is small, consider dipping the toothbrush into the vinegar and brushing it directly on the sticky stuff. Regardless of what tool you use, make sure you employ soft strokes to prevent any damage to the fabric. Once you peel off all of the gum from your clothing, you may have to deal with a sugar stain. 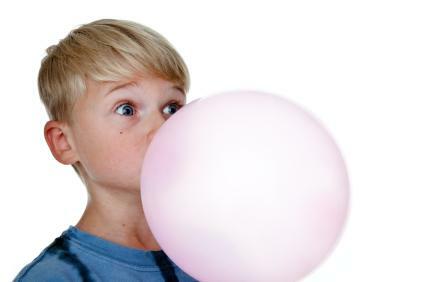 Some flavored chewing gums can leave behind brown or rust-colored sugar stains. If you encounter such a stain on your cotton or polyester garment, then treat it with an enzyme-based laundry detergent, such as Wisk or Era, then wash it per the clothing item's directions. However, be sure to check that the stain has been completely washed away before placing the item in the dryer. Heat from the dryer can set sugar stains on clothing.